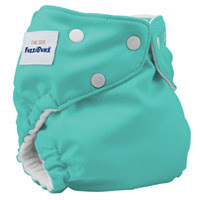 The St.Hilaires: Adventures in Cloth Diapering: Reviews and New Diapers! Adventures in Cloth Diapering: Reviews and New Diapers! We just bought our second batch of cloth diapers! I was so eager to pre-wash them when they arrived that I forgot to take a picture of them to show you... As I am typing they are being pre-washed so they are ready to be used! Before I tell you about our new diapers, I wanted to give you reviews on the diapers we bought last month. As you may recall from my first post about cloth diapering, we first purchased 3 Bum Genius 3.0 diapers, 7 Indian pre-folds, and 1 Bummis Super-Snap Cover. We like how simple this diaper is. It is very easy to put on! I love that this is a one-sized diaper, meaning that it should fit John until he is potty trained. The pocket diaper dries really fast, the inserts take a little more time... but it's not too bad. We are pretty disappointed with the quality - after being washed only two times, one of the seams securing the Velcro began to come undone. On a positive note, I had an easy time getting a replacement diaper from cottonbabies. Their customer service was great! Just last week, one of the inserts began to fray, revealing the layers of the insert. Not good! =( So, once again, I will be contacting Cottonbabies to see if I can get another replacement. Overall, we are not too impressed with this brand. We are having issues with wear and it has only been one month! Thus, we will search for a better diaper. I really like these pre-folds! Stains come out mostly in the wash. The sun takes care of what ever is left. No major problems with leaking! They are very cost effective! The only down side we have noticed is they make John look like he has a big bottom (not that it really matters!). This also means that his clothes are tighter when he wears a pre-fold. This has been a good cover. I like the snaps on this cover, compared to the diapers with Velcro. I think the snaps will last longer. The cover dries very fast! If the cover does not get poo or pee on it, it can be used a few times before being laundered. The down side is you have to buy different sizes as your baby grows. This isn't bad, I just love the idea of diapers being one-sized! On to the new diapers: we just bought 3 Fuzzibunz one-sized pocket diapers (they are a lot like the Bum Genius diapers we have), 6 Chinese pre-folds (they are a little thicker than Indian pre-folds), and 2 one-sized Blueberry covers. Everything has snaps this time because I think they will endure more years of diapering than Velcro. We shall see how these new diapers compare after a month or so! Other good news is I think we have enough diapers to do cloth full-time. I will have to do wash every other day, but that is about how often the diapers should be cleaned anyway. Hi Lindsey - man, I wonder if your washing machine is not being good to those diapers? We have like 14 Bumgenius and haven't had those troubles at all- weird! I will be curious what you think of fuzzibunz - I was tempted to get some, but we decided to stick with BG. Let us know! Hope you guys are doing well! hey there. Glad it is working for you, I only tried the prefolds and did not like at all or seem to work, Emma ALWAYS Leaked and her clohtes didn't fit. I have a ton of them and other covers etc if you want any...was thinking of trying to sell on craigslist or something, not sure I will attempt with this next baby unless I buy AIOs or something more similar to a diaper. Did you use snappis with the prefolds?? Keep up the good work!